Drive Sober – Summer Law Enforcement Crackdown to Begin | Hupy and Abraham, S.C. The 2016 national law enforcement crackdown campaign, "Drive Sober or Get Pulled Over," goes into effect across the country from August 17 to September 5, 2016. According to the National Highway Traffic Safety Administration (NHTSA), the weeks before and the weekend of Labor Day witness some of the worst drunk-driving accidents. 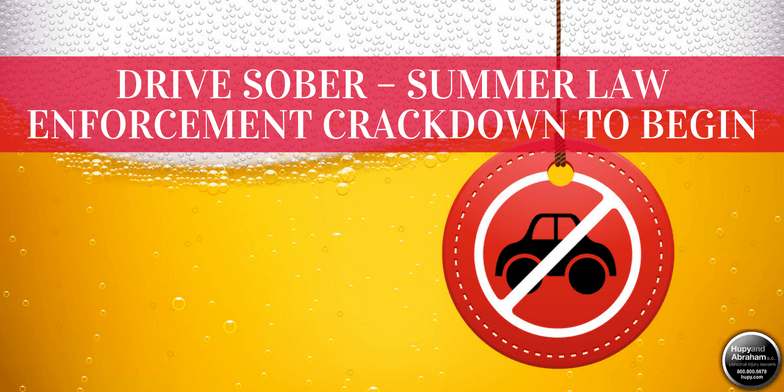 To curb this dangerous trend, local law enforcement will partner with the NHTSA in this campaign to reduce drunk driving as summer comes to a close. During “Drive Sober or Get Pulled Over,” local law enforcement will show zero tolerance for drunk driving. Increased state and national messaging about the dangers of driving drunk, coupled with sobriety checkpoints and increased officer presence on the road, hope to drastically reduce drunk driving during the busy end-of-summer weeks. On average, over 10,000 people died each year (2010 to 2014) in drunk driving crashes. In 2014, approximately 1 in 5 children killed in traffic crashes (14 and younger) were passengers in drunk-driving crashes. Fifty-six percent of the time, it was the child’s own driver who was drunk. Motorcycle riders have the highest overall rate of alcohol impairment in fatal crashes. In 2014, 29 percent of the motorcycle riders killed were riding while impaired. Nighttime is the most dangerous time to be on the roads. During the 2014 Labor Day holiday period, 83 percent of drunk-driving crash fatalities occurred between 6 p.m. and 5:59 a.m.
More than a quarter of the crash fatalities that occurred on Labor Day weekend involved drivers with a blood alcohol content of .15 or higher – almost twice the illegal limit. In addition to the human toll drunk driving takes on our country, the financial impact is devastating as well. Based on 2010 numbers (the most recent year for which cost data is available), impaired-driving crashes cost the United States $44 billion annually. These figures from the NHTSA exemplify the serious nature of distracted and intoxicated driving. Everyone has the ability to help end these preventable deadly accidents. Remember that buzzed driving is drunk driving and there will be zero tolerance for impaired driving in the coming weeks. At Hupy and Abraham, we’ve represented numerous victims of drunk-driving accidents. If you or a loved one is injured in an accident due to the negligent actions of an intoxicated driver, contact Hupy and Abraham anytime with your questions. Call 800-800-5678 or start a live chat 24/7 at Hupy.com.